Posted on April 15th, 2016 by Jacob. Although summer may be on the way, one lesson we’ve learnt from filming outside is you can NEVER rely on the British weather! Cameras generally don’t like water. Have a look in your camera’s user manual and check whether the camera is sealed, or even better if it’s waterproof! If you’re moving inside and outside, remember camera lenses can fog up, they can take a while to de-mist, and sometimes they might not even work when they’re too cold! Allow extra time for the equipment to adjust to its new location. Even if your camera is waterproof, it’s important to protect it and yourselves from the elements; take an umbrella for the crew and something to cover the camera with, professional camera covers are available, but even just a plastic bag will do the job. 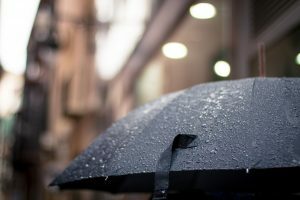 If you use an umbrella, the rain WILL make noise, if you’re recording sound you will need to think about protecting your microphones, and maybe even re-recording dialogue and sound effects on another, less rainy day. So there you have it, just follow these tips and the rain shouldn’t dampen your squibs. (If you’re planning to film an explosion).